Testimonials from our clients are the proof in the pudding. You lived up to your name! You rescued us! Having lived in the same house near Asheville, NC for 29 years, we were nervous about moving to Blue Ridge, GA. From the day we first talked with you until the day the last piece of furniture was moved, you executed our move FLAWLESSLY! You didn't just do what you promised, you went well above in every detail. Your moving skills were top flight, but your attitude and desire to please were unexpected. After two long days, we were amazed at the crew's willingness to stick around our new home to make sure everything was perfect. We will recommend you to anyone who asks! I can’t thank you enough for all the help you gave me after my parents’ passing. It was a sad and difficult task to close their home and decide what to keep and what to let go of, from a lifetime of memories. You carefully packed and shipped 15 large boxes containing letters going back to the 1920’s, letters between my parents from WWII, birth and baptismal certificates, photo albums, important business papers, large oil paintings and delicate statues. You also carefully packed my father’s many hand-carved ducks and waterfowl. Everything arrived here in California in excellent condition. There was no breakage or damage of any kind. Our family will treasure these items and they will be passed on to our grandchildren. It was so easy to leave John with the designated items, walk out the door and know they were in good hands. I have no idea how we would have gotten all this home on our own. God bless you." "We felt we had a guarantee of great moving experience when we first met you two and we wanted you to know that it was confirmed during each step of the process. As you know we have previously moved a number of times and frankly it became evident during those moves that it wasn't how 'good' the move would be, but rather 'fair', 'tolerable' or 'outright disappointing'. 'Jenny and John to the Rescue' is a fitting name for your company. Professional, on time, careful, thorough, honest and great packers (confirmed again when we unpacked). The degree that John and Jose took to protect our belongs was the best we've ever had. We want you to know that we'll have you travel to South Carolina to move us again to our new house when it's finished...and wherever life takes us thereafter. Relocating is generally always a fairly difficult time...thanks for eliminating the stress associated from the moving phase for us." "Thanks again for your help this past weekend! I’ve moved many times over the years, but this move was absolutely the smoothest and most professional. You definitely go 'above and beyond' to provide excellent service. Just wanted you guys to know that John's packing job was MASTERFUL! It's amazing to see how he fitted stuff in, and everything came through without the slightest damage--even really fragile stuff. If you ever need us to reassure potential customers that they are in good hands, we'd be happy to talk to them! Thanks for everything you guys did." 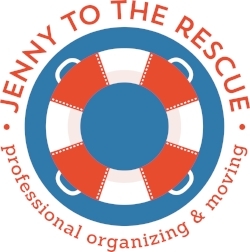 "Jenny To The Rescue literally helped save our sanity when we repatriated from overseas with not one, not two, but three shipments! My husband and I were overwhelmed, and Jenny and her crew came in and not only helped us unpack, but purge and organize! They hauled off boxes, paper, and took items to be donated. We WILL be calling Jenny To The Rescue again for help around the house with projects." "I've never met anyone like Jenny - and I know plenty of talented people. She sort of defies one definition or characterization. Her mind is always organizing: lists of items, necessary elements, aspects of a project, what the next step should be. I assume there is a chess match going on in her head at all times and she's winning. Then you combine it with this enormous heart for other people and other people's challenges. She's so tender and generous and then analytical and "let's do it right." That combination of big heart and organized mind is what makes clients and friends so grateful for her and crazy about her." "Jenny To The Rescue is compassionate, tasteful, capable help when you need it the most. More than trustworthy, they are friends you can turn to for a full range of services from transport to graceful decorating." "There are few things that are more stressful than relocating a family, especially one with young children. As difficult as the move from point A to point B can be, an equally significant challenge begins when the movers vacate the premises that they have just filled with a sea of unrecognizable boxes and furniture. Just thinking about the experience can be quite daunting!